Packing for an Alaska land tour is different from packing for an Alaska cruise. Your daily schedule will be more intense, the terrain you visit will probably be more varied and you will travel to many different places during your trip. Even so, you will need fewer changes of clothing because you will not have to dress up for dinner (or anything else) during your Alaska land tour. Your Alaska itinerary will probably include stops in several different places. Many tours begin in Anchorage because of its large, modern airport and its reasonable driving distance from the Seward cruise port. 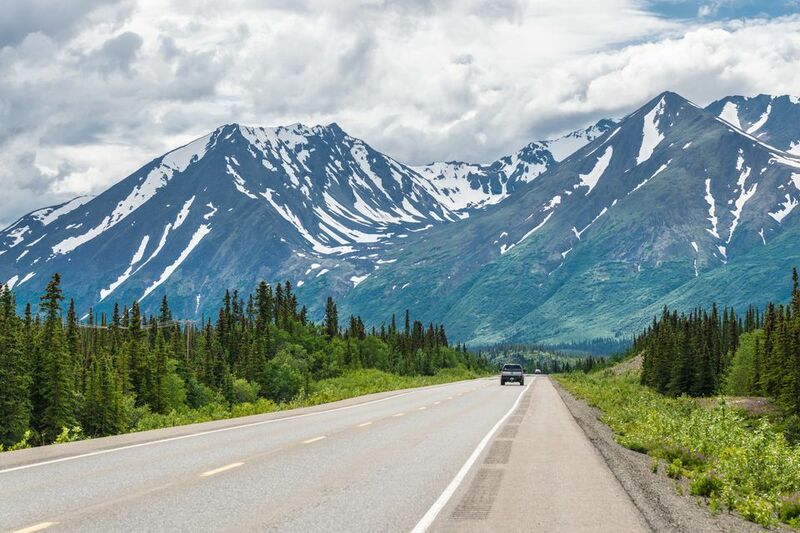 From Anchorage, you may travel to Fairbanks via Whittier and Valdez or head north to Talkeetna and Denali National Park and Preserve, then loop north and west to Fairbanks. Your itinerary may also include the 92-mile, six-hour bus trip into Denali National Park and Preserve, either to spend a day hiking and viewing Denali or to stay a night or two at one of the lodges at the end of the Park Road. As you pack, emphasize comfort and safety. Bring comfortable walking shoes, jeans, short- and long-sleeved shirts, rain gear, sun gear and a warm sweater or jacket for Northern Lights wakeup calls. If you are traveling during the height of summer, you may want to pack a pair of shorts, too. Your shoes should be comfortable beyond compare. Bring broken-in walking shoes, hiking boots or whatever makes your feet feel wonderful on uneven, rocky ground. Wear them on the plane, because if you pack them, they will take up a lot of room in your suitcase. Contrary to popular belief, you don't need to wear a new outfit every day. Change your underwear and socks daily, but you can re-wear shirts and jeans at least once during your trip. Depending on your itinerary, you may be able to do laundry, which will allow you to pack even lighter. Most hotels provide hair dryers. Ask if you don't see one in your room, as some hotels keep loaner hair dryers at the front desk. If you prefer to bring your own hairdryer, you can, but it's not an absolute necessity. People on your tour will not be cataloging your daily clothing choices. They are far more interested in seeing wildlife, whales, the Northern Lights, and Denali. Alaska's scenery is amazing, and you will definitely encounter wildlife on your tour. Bring a camera or smartphone that takes great pictures. Pack an extra camera in case your battery dies at the worst possible moment. Make sure that backup camera is charged and ready to use. On a one-week trip, you will probably take 50 to 100 photos per day. If your smartphone or camera cannot store that many photographs, pack an extra Sandisk or other image storage device. If you plan to photograph the Northern Lights, consider bringing a tripod and a camera that can take long-exposure photographs. A chilly morning in Denali National Park and Preserve can give way to a sunny, warm noon hour. If you plan to hike or take a whale watching boat tour, you will need to wear layers. A windbreaker or light jacket will protect you from rain, breezes, and cool temperatures. On chilly mornings, a sweater or sweatshirt can be your best friend. Later in the morning, you may want to take those top two layers off in favor of a T-shirt or moisture-wicking athletic shirt. Nights can be cool; your sweater or sweatshirt should be your go-to layer if you want to view the Northern Lights or Milky Way. Alaska's air is dry. If you have dry skin, bring moisturizer or lotion. Sunscreen will come in handy if you spend a lot of time outside. Buy small, travel-sized tubes from a big box store or grocery store. Remember to use sunscreen if you fly to a glacier. While you won't find snakes or ticks in Alaska, mosquitoes and gnats abound. Be prepared; pack insect repellent. Bring netting if you plan to do any back country hiking or camping. Trekking poles can come in handy, too. If you are staying at one of the lodges in Denali National Park and Preserve, ask about borrowing trekking poles during your stay. Binoculars will help you see bears, caribou, and other wildlife. If you plan to do laundry, pack laundry soap and dryer sheets. Laundry soap "pods" are portable and easy to use. Toss one into the washing machine along with your clothes; don't put the pod in a liquid soap loading compartment on top of the washer. A map, while not a necessity, can help you get your bearings and appreciate just how large Alaska really is. If space permits, bring a highlighter and trace your route as you travel. When you return home, you can use the map and your photographs to tell family and friends about your trip. Save some luggage space for souvenirs. The bookstores and National Park gift shop bookshelves in Alaska are extremely tempting, and T-shirts and sweatshirts take up a lot of suitcase space.